NotesVideo: Spring Green SaladCooking for a Crowd? Wash and dry spinach, tear into pieces, and chill. To prepare orange: Cut off peel and membrane of outer part of the sections. Using a paring knife gently cut out sections from membrane edges. You end up with orange sections with no outer membrane. To make dressing: Combine all ingredients in a jar and shake well or blend in a blender. 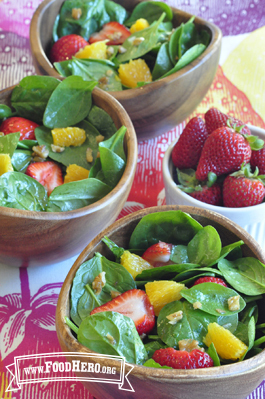 Right before serving, toss orange and strawberries with walnuts and spinach. Add dressing to coat salad. Serve immediately. 3 Comments for "Spring Green Salad"
I love this salad and the dressing is really great! I actually make extra dressing and keep it in a mason jar in the fridge to use on all my salads. I just love putting fruit with spinach. Its a great combo! I love this salad! I left out the sugar and it was plenty sweet with the orange juice. I also used slivered almonds because that was what I had on hand. It's very refreshing and a nice change from the standard green vegetable salad. REALLY enjoyed this salad and super easy/quick! Made it with Peanutty African Stew for dinner and it was a great success. To be honest I didn't measure out the salad ingredients but simply put the ingredients into a salad bowl in an amount I knew would be big enough to feed the family. Then did of course measure out the salad dressing ingredients -- great dressing! Will make again even for other salad fixings. Strawberries and oranges were on sale this week so this was an extra special recipe. Oh, and for the OJ in the dressing I just squeezed a half an orange leftover from making the salad and got the juice I needed.